Stage magician and amateur detective The Great Merlini made his debut in Clayton Rawson’s 1938 novel Death from a Top Hat. 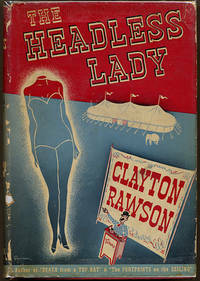 Rawson wrote a total of four Great Merlini mysteries, the third (and the subject of this review) being his 1940 The Headless Lady. Clayton Rawson (1906-1971) was himself a magician as well as a mystery writer so it’s no surprise that not only is his fictional detective a magician but that illusions play an enormous role in his stories. Stage magic is entertaining enough but in The Headless Lady we get an extra added bonus - a circus setting. A woman is very very anxious to buy a particular illusion from The Great Merlini’s magic shop. So anxious is she that she is prepared to pay more than twice the asking price and even to steal the apparatus. This naturally intrigues Merlini. The fact that someone is now tailing him intrigues him even more. It doesn’t take him long to figure out that the woman is connected with the Mighty Hannum Combined Show circus. Merlini absolutely loves circuses of course so that’s where he and his faithful Dr Watson, Ross Harte, are now headed. Their arrival coincides with a great misfortune for the circus - the owner, Major Hannum, has been killed in a car crash. This comes as quite a surprise - the Major was a notoriously slow and careful driver and yet his car apparently lost control at high speed. By pure chance the first person at the scene of the tragedy was a reporter and naturally he took some photographs. These photographs disturb Merlini greatly. Was the crash really an accident? And what could have been the reason for another curious accident a short time before the Major’s demise? Why is the circus playing towns that are much too small to be paying propositions? And how to explain some curious financial transactions? Merlini’s suspicions are further inflamed by another unlucky accident that occurs on the following day. A murderer is loose in the circus but this is a very cautious murderer indeed - it is going to be extremely difficult to prove that these incidents are not in fact accidents. Proving the identity of the killer will be even more challenging. This book itself is a fine example of the method of the professional illusionist - misdirection. Rawson throws so many outrageous incidents and so many colourful details of circus life at the reader and keeps the pacing so frenetic that we are unlikely to notice any deficiencies that might afflict the plotting, and we’re very likely to be distracted from noticing the vital clues. It’s also likely to make us overlook the fact that this story is not quite as fair-play as purists would demand - there’s some vital information that is to some extent pulled out of the hat at a rather late stage without any adequate foreshadowing. Apart from this the plotting is very sound. Merlini is a fine and very entertaining detective hero with a blithe disregard for irritating legal niceties. If the best way to find an important piece of evidence is to indulge in a spot of breaking and entering then that’s what Merlini will do. He is an old carnival hand and like most carnival folk he has an exceptionally flexible attitude towards such matters and is not overly inclined to trust the police to the extent of actually telling them anything. Merlini’s ability to pick any lock he encounters and to see through any kind of trickery combined with the subtle psychological tricks that one picks up as a carnival person could have made him too perfect and infallible but Rawson is aware of the danger and makes sure that his hero does make the occasional error of judgment. The sheer amount of background that Rawson gives us on circus life, the digressions on carnival slang and the footnotes could threaten to slow the action but it’s all such interesting stuff that I for one have no complaints. I have to admit that I like novels with footnotes! And despite the digressions the story really does hurry along quite satisfactorily. It’s interesting to compare this one with Anthony Abbot’s slightly superior 1932 About the Murder of the Circus Queen which is probably the best circus mystery I’ve come across so far. The one possible downside is provided by by minor reservations about the fair-play nature of the plot but that is more than compensated for wonderful atmosphere and plenty of clever tricks. Highly recommended, although his earlier The Footprints on the Ceiling is perhaps slightly better. I don’t know anything about Ralph R. Perry other than the fact that he was a pulp writer who produced stories for magazines like Argosy. His best-known creation seems to be Bellow Bill Williams, a tough much-tattooed pearler. The Bellow Bill Williams stories belong to the South Seas adventure sub-genre and that’s a sub-genre that is rapidly becoming a favourite of mine. Even more than most adventure stories of the past South Seas adventure tales (and the closely related Tales of the Mysterious Orient sub-genre) conjure up a vanished world, a world that was swept away by the Second World War. It was a world in which a man who chose to do so could simply vanish. Once you reached a remote Pacific island or one of the cities of the Far East you were effectively out of the reach of western civilisation. Most importantly, you no longer needed to worry about the rules of western society. There were certainly rules you had to heed if you wanted to survive but they were different rules and for a certain type of man (and perhaps to an extent for a certain type of woman) that had a lot of appeal. These were of course communities of European and American expatriates but if you really wanted to escape you could, in the colourful phrase of the day, go native. 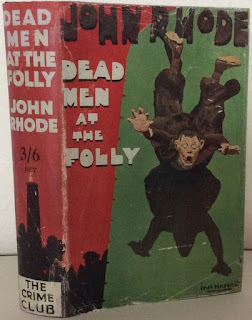 Whether this world of adventurers and misfits really existed or whether if it did it bore any relation to the world of the adventure pulps is another matter. What is important is that people believed such a world existed. Fictional worlds sometimes seem to be more real, and are certainly a good deal more interesting, than the real world. Which brings us back to Bellow Bill Williams. He featured in a series of stories in Argosy in the 30s. Whether Terror Island (dating from 1933) is typical or not I can’t yet say - this is the first Bellow Bill Williams story I’ve encountered. What I can say is that it’s a whole lot of fun. Bellow Bill Williams is hired by a blind man to find his son, kidnapped by a scoundrel named Clipper Clarke. The blind man is Nick Atterson, a bit of an adventurer himself in his youth and now a wealthy trader, and also a man for whom Williams has often worked in the past. Clipper Clarke is holding Nick’s son Tom hostage on a remote volcanic island. Clipper’s domain is defended by his loyal and extremely fierce Papuans and by a series of ingenious man-traps. No sane man would venture to set foot on the island the Papuans call Terror Island but Bellow Bill Williams is not a man to worry about such risks. The story is a non-stop action roller-coaster ride with some nicely fiendish touches. The style is exceptionally pulpy, which is exactly how such stories should be. Bellow Bill Williams is a fine square-jawed action hero, as hard as nails but with a string streak of decency and fair play. Clipper Clarke is a very serviceable villain, cowardly but treacherous and cunning. 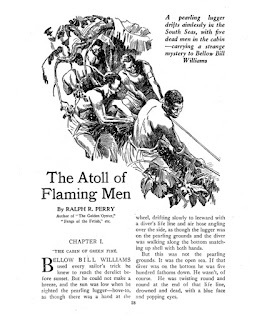 The Atoll of Flaming Men appeared in Argosy in 1935. Bellow Bill Williams encounters a pearling lugger, apparently abandoned. On board are five dead men, with a diver also dead at the end of his lifeline deep beneath the surface of the water. One of the dead men in the cabin, a European, has been tortured. The oddest thing is that of the five dead men only one has a visible wound to explain his sudden demise. And three of the men in the cabin, all Melanesians, have their faces smeared with a strange greenish substance which glows in the dark! Bill tows the lugger to the closest atoll where more surprises await him. The Golden Oyster is a treasure hunt story, published in Argosy in 1935. A professor trying to prove an arcane point about the Basque language has somehow stumbled across a story fold by a Basque cabin boy of gold from a Spanish treasure ship lying on the bottom of the lagoon of a coral atoll. Unfortunately Professor Griswold has foolishly allowed the secret to slip out and now there are assorted cut-throats after that gold. Bellow Bill knows the South Seas and he’s an old hand at adventure but in this tale he makes a serious error of judgment which could have disastrous consequences. Sometimes a man can be too suspicious! Bellow Bill Williams is a giant of a man and most of his body is covered by tattoos. To say he has led an adventurous life would be an understatement. He doesn’t necessarily go looking for adventure - it goes looking for him. He’s every inch a man of action but although he carries a gun he is, by his own admission, an incredibly lousy shot. Fortunately he knows plenty of other ways to deal with evildoers. Unlike many adventure heroes he has no regular sidekick. He is a loner. He’s not a morose or a self-pitying loner and he’s not even particularly anti-social. He has simply chosen his own path in life and it’s a path best walked alone. The style of these stories is pulpy in the extreme but the lack of polish is more than compensated for by tight pacing, plentiful action and some nicely imaginative touches of the the weird and the gruesome. Great stuff. Highly recommended. 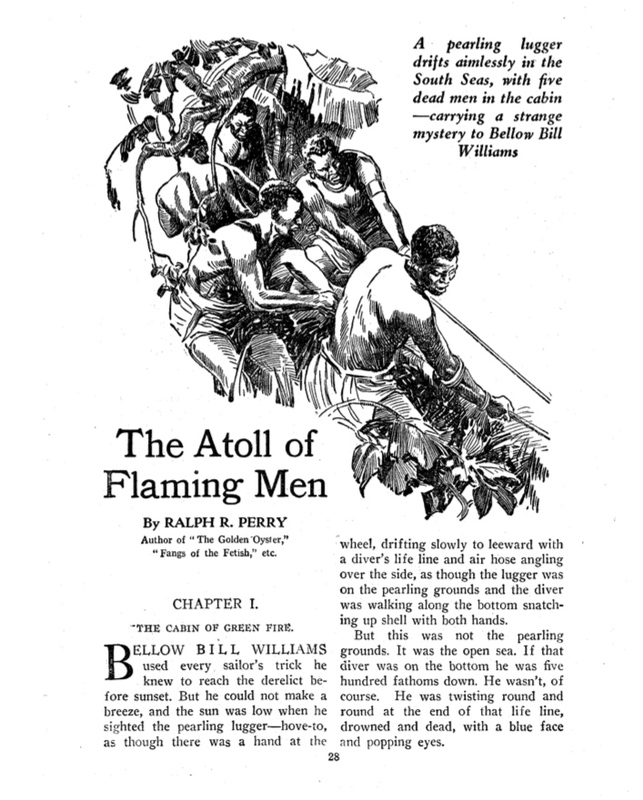 I discovered the Bellow Bill stories through the True Pulp Fiction blog. These stories can be found at Ron Unz's website - Terror Island, The Atoll of Flaming Men and The Golden Oyster. Some Buried Caesar was Rex Stout’s sixth Nero Wolfe mystery and appeared in 1939. It’s notable for being one of the fairly rare Wolfe books in which the gargantuan private detective leaves his beloved brownstone on West 35th Street. He not only leaves New York - he spends the entire book in the countryside, probably Wolfe’s least preferred environment. What could possibly have induced Wolfe to venture into rural surroundings? If you guessed it had something to do with orchids you’d be right. He has entered some of his prized plants in competition at the North Atlantic Exposition held in Crowfield in upstate New York. He fully expects his plants to win and he does not intend to miss the pleasure of witnessing the discomfiture of his arch-rival orchid fancier Mr Shanks. The trip almost proves fatal. His indefatigable assistant Archie Goodwin loses control of the sedan after a tyre blows out. A car crash is bad enough (Wolfe abhors motor vehicles at the best of times) but worse is to follow as Wolfe finds himself marooned on a large boulder being menaced by a very large and very enraged bull. The sedan being temporarily hors de combat Wolfe and Archie are stuck for several days at the home of Thomas Pratt, the owner of a chain of cut-price restaurants (known as pratterias). The bull proves to be the means of introducing Wolfe to a strange bucolic drama. The centrepiece of the drama is the bull, Hickory Caesar Grindon. Hickory Caesar Grindon is not just any bull. He is a National Grand Champion. As Guernsey bulls go he is the ace of aces, the finest example of the breed in the country. And Hickory Caesar Grindon is about to be turned into beefsteaks. He has been purchased by Thomas Pratt. Having paid a record price for the bull ($45,000 which was an immense fortune in 1939 dollars) he thinks it would be a splendid publicity stunt for his pratterias to have Hickory Caesar Grindon butchered and served up to a hundred invited guests (including as many celebrities as he can rustle up). That works out at $450 per diner, a ludicrous amount but Pratt is convinced the publicity will be well worth the price. The idea of a National Grand Champion being converted into hamburger has sent shock waves throughout the local community and in fact throughout the entire Guernsey cattle establishment nationwide. Pratt finds himself a very unpopular figure among cattlemen some of whom will stop at nothing to prevent his stunt from coming off. In this tense atmosphere it’s perhaps no surprise that murder soon follows, but the victim is not the obvious one. And the chief suspect is none other than Hickory Caesar Grindon. Nero Wolfe knows quite well that Hickory Caesar Grindon is innocent. Somebody committed murder but it was not the bull. However it’s none of Wolfe’s business. By the following day it has become Nero Wolfe’s business. The difficulty is that this is a murder that will be particularly difficult to prove. Along the way Archie Goodwin risks ruin at the hands of a femme fatale and organises a trade union among prisoners in the county jail. The North Atlantic Exposition proves to be not only the place to be if you love orchids or Guernsey cows but also the scene for murder. Stout has not always been admired for his plotting but in this novel he really knocks one out of the park. The solution is not merely satisfactory, it is pleasingly elegant in its simplicity and plausible. Wolfe can see a number of possible solutions to a puzzle that seems on the surface to be fiendishly complicated. All the solutions have the disadvantage of being distressingly complex and far-fetched. All except one. That solution is obvious, but it is only obvious once Wolfe explains it. Of course if you’re a writer of detective stories then the ability to make the simple seem complicated, and the complicated seem simple, is obviously a considerable asset. Everything else is as you expect in a Nero Wolfe mystery - plenty of amusing byplay between Wolfe and Archie, sparkling dialogue and plenty of beer drinking. It was not at all uncommon in detective fiction of this era to have a vital clue provided by an animal. Erle Stanley Gardner was particularly fond of the idea. The great thing about animals is that they themselves cannot lie but the evidence they provide can be misinterpreted. Having an animal as a suspect rather than just a witness was more unusual. In this case it works extremely well. Nero Wolfe knows nothing about cattle but he knows all about murder and he knows all about evidence and the way it can be manipulated. 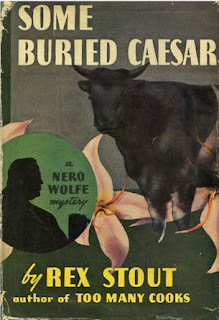 There are those who consider Some Buried Caesar to be the best of all the Nero Wolfe novels. Since I haven’t read them all I can’t offer a specific opinion on that but I can say that this is an exceptionally fine detective tale. Very highly recommended. 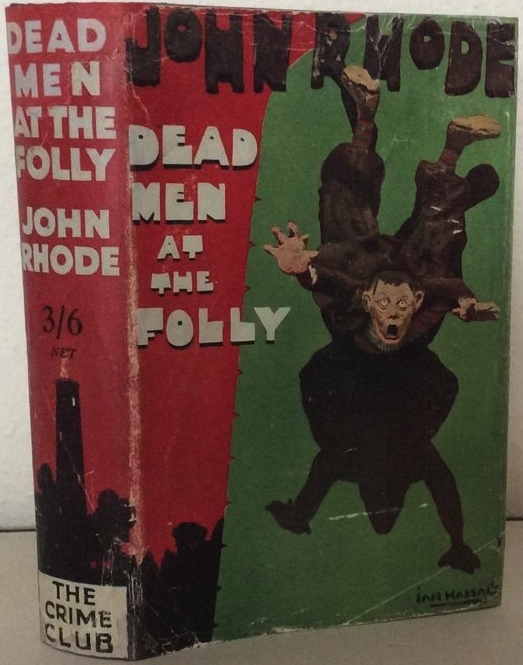 Dead Men at the Folly was the thirteenth Dr Priestley mystery written by Cecil John Charles Street (1884-1964) under the pen-name John Rhode. It was originally published in 1932. Street was a popular writer in his day but his work has languished in obscurity since his death. Or at least this was the case until quite recently. in the past few years the detective fiction of the so-called golden age has been experiencing a major revival in popularity. 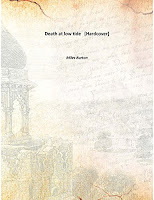 And with the reprinting by the British Library of a couple of the detective novels he wrote under the name Miles Burton the work of Street is now beginning to attract considerable interest. In fact at the present moment just about every vintage crime blogger seems to be blogging about Street’s books. The excellent Beneath the Stains of Time blog has for example just featured an excellent review of the Miles Burton novel Death in the Tunnel. 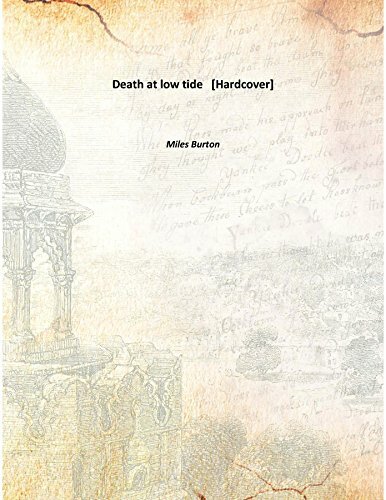 Having only read one of the Miles Burtons I can’t comment too much on them although Death at Low Tide was certainly very good indeed. On the other hand I’ve read quite a few of the Dr Priestley mysteries and I count myself as an enthusiastic fan. Dead Men at the Folly opens with a motorcyclist lost in the countryside. He notices a very striking structure at the top of a ridge not too far off the road and feels compelled to investigate it. The structure is Tilling’s Folly, a tall circular tower topped with an observation gallery. On the ground at the base of the tower the motorcyclist makes a gruesome discovery - the dead body of a man. Inspector Richings of the local constabulary at Charlton Montague is soon on the scene. It seems to be a fairly obvious case of suicide but Richings is a careful and thorough policeman. He is not inclined to overlook the small details and those small details cause him some concern. He suspects foul play. Fortunately the Chief Constable is a sensible fellow as well and both men realise that this has the potential to be a difficult case. Furthermore they can make no progress in identifying the dead man, which strongly suggests this might not be a purely local matter. The prudent thing to do would be to ask Scotland Yard for assistance and the sooner the better. As the discovery of the body took place on the Saturday before Christmas Day Superintendent Hanslet of Scotland Yard finds he has no-one available to assign to the case. He therefore decides to take on the case himself. Hanslet doesn’t take long to realise that Richings’ suspicions were well-founded. This is murder. Initially the case seems likely to be frustrating and time-consuming. No progress has been made in identifying the body. And then, as often happens, all the pieces start to slot neatly into place. It was all very straightforward after all. Within just a few days Superintendent Hanslet has solved the case. He is so pleased with himself that he can’t wait to tell his old friend Dr Priestley. Oddly enough the irascible but brilliant scientist and part-time criminologist doesn’t seem overly impressed by Hanslet’s solution, and Priestley is tactless enough to point out what appear to him to be some very major flaws in an otherwise satisfactory solution. Hanslet however is so convinced of the essential soundness of his own theory that he dismisses such annoying nit-picking. Dr Priestley is a fine fellow and a good friend and unquestionably brilliant but he is often inclined to cast quite unnecessary doubts on Superintendent Hanslet’s theories. Hanslet returns to Charlton Montague full of confidence that he is just about to wrap the case up when a discovery is made that reveals that his wonderfully impressive theory is in fact a house of cards and, as houses of cards are wont to do, is about to collapse in an untidy heap. It appears Hanslet is going to need Dr Priestley’s help after all. Dr Priestley does not make his first entry until quite late in the game and he remains very much in the background. He’s such a memorable character that he still somehow manages to dominate the story and there’s perhaps something to be said for keeping him in reserve so that the reader anxiously awaits his appearance knowing that his arrival will kick the plot into high gear. Rhode’s plotting is strong, as always. While Rhode has often been dismissed as a dull writer I found the setting to be quite vividly rendered. The Folly itself is a perfect setting for murder. Rhode tended to avoid country house settings and the characters for the most part are drawn from the middle class or have even slightly more humble backgrounds. The book gives us quite an entertaining glimpse of a vanished but very everyday reality. A fine entry in the Dr Priestley series, highly recommended. Hammond Innes (1913-1998) was one of the big guns in the British thriller scene in the postwar years. His first novel appeared as early as 1937 and by 1948 when The Blue Ice was published he was already a very well established writer. 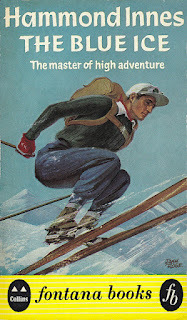 Innes differed slightly from other popular British thriller writers of his era (writers like Ian Fleming, Alistair MacLean, Gavin Lyall and Desmond Bagley) in that his books were adventure fiction rather than dealing with espionage or organised crime or similar subjects. The hero of The Blue Ice is also not in any sense a professional. He is not a secret agent or an undercover cop. He is a mining engineer. The heroes of the earlier generation of British thriller authors who flourished during the 1920s and 1930s were also usually not professionals but they were enthusiastic amateurs who actively sought out adventure. Innes’s hero is not of this type. After retiring young (he’s thirty-six) following a meteoric business career all Bill Gansert wants to do is to sail his yacht to the Mediterranean, soak up some sunshine, lie on some beaches and sample the local wines. He has no desire whatsoever for adventure. Gansert’s plans change when his old boss asks him to go to Norway instead of the Mediterranean. Another minerals expert, George Farnell, has just been found dead there. Gansert knew Farnell quite well and he’d like to find out what happened - the story doesn’t quite add up. Before his death Farnell had sent a mineral sample (of a very valuable mineral indeed) to Britain, hidden inside a chunk of whale meat. Gansert is certainly intrigued by the puzzling circumstances of Farnell’s death but the main reason he agrees to go to Norway is the thought that Farnell really had made a very major and very valuable find. It’s not that Gansert is motivated by money - he’s simply obsessed with minerals and loves the challenge of developing a new mine. He’s like a butterfly collector on the trail of an exceptionally rare specimen - he just can’t help himself. Gansert will have some uneasy company on the trip. Firstly there’s Jill, who knew Farnell very well (although just how well Gansert isn’t sure). Secondly there’s a shady Norwegian businessman who happens to represent a competitor, or possibly a future partner, to Gansert’s old company. And thirdly there’s the crippled Dahler, a Norwegian exiled from his country for collaborating with the Nazis. The most interesting character in the tale is Farnell. Even though he’s dead when the book begins his shadowy presence in the background dominates the story. Farnell had been obsessed by mineralogy to an extreme degree, he had been convicted of fraud and during the war had worked (in slightly mysterious circumstances) with the Norwegian Resistance. The war is yet another shadow looming over the story. It seems like everyone involved claims to have fought for the Resistance but all have also been suspected of collaborating with the Nazis. There’s an atmosphere of suspicion, deception and betrayal and when you add the lure of greed the combination is obviously going to be explosive. Innes made something of a specialty of maritime adventure tales and a large part of this novel takes pace at sea, or by the sea, or even under the sea. 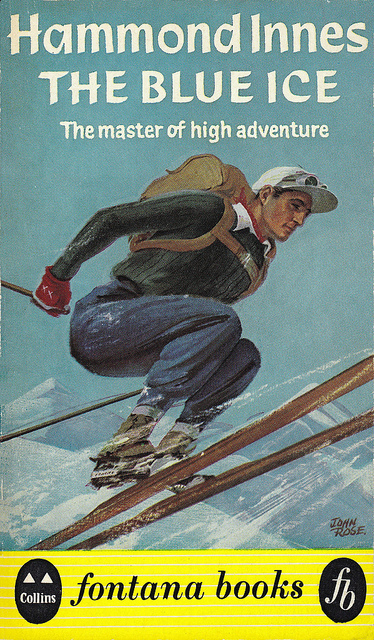 Later the action moves to the snow-covered wastes of a glacier with an epic ski chase. The British thriller writers of the postwar period seemed to be strangely drawn by settings involving ice and snow. Alistair MacLean was of course famous for his superb use of such settings in novels like Night Without End but Desmond Bagley (in Running Blind) and Gavin Lyall (in The Most Dangerous Game) also used such settings with considerable skill. Innes certainly makes the most out of the Norwegian locales. Innes was noted for spending a great deal of time researching his novels and the effort obviously pays off in this case. Modern readers might not be too thrilled by the detailed descriptions of a whaling station but it does add atmosphere. This is not what one would call an action-packed story. There’s not much action at all until quite late in the story. Mostly Innes relies on slowly building up the tension, and he does this very successfully. When the action does pick up it does so quite effectively. The Blue Ice is more a psychological thriller than an action thriller but the author carries it off with both flair and subtlety. Highly recommended. Major Cecil John Charles Street (1884-1964) was one of the most prolific of British golden age detective fiction authors. As well as seventy-odd Dr Priestley mysteries published as John Rhode he produced more than sixty mysteries under the pseudonym Miles Burton. The Miles Burton books featured amateur sleuth Desmond Merrion, usually working alongside his friend Inspector Arnold of Scotland Yard. Death at Low Tide appeared in 1938. Captain Stanlake is Harbour Master at Brenthithe, a sleepy little port in the West Country. Stanlake is a man with vision but he is not a popular man. He has plans to transform Brenthithe into a bustling commercial port. This would be of great benefit to some of the town’s inhabitants, but not to all of them. Brenthithe is effectively two towns. The Old Town relies on fishing and on Brenthithe’s rapidly declining status as a port. The New Town depends on tourism. Stanlake’s plans would benefit the Old Town but would involve draining Bollard Bay, which would effectively destroy the tourist trade (Bollard Bay being a paradise for small boats). All of this might seem irrelevant but it is in fact crucial to the plot. Stanlake’s plans have aroused a great deal of opposition and there are many townsfolk who would be overjoyed were he to fall off the pier one fine day and drown. And one day he does fall off the pier. But he does not drown. He is dead before he hits the water, with a bullet hole neatly placed between the eyes. The Chief Constable realises immediately that he is going to need the assistance of the Yard, and that assistance soon arrives in the person of Inspector Arnold. The case might well beyond that fine officer as well and Arnold is rather relieved when his old friend Desmond Merrion turns up. The case is baffling indeed. Stanlake was alone on the pier when he was shot. He could not have been shot from a boat - the angle at which the bullet struck the victim’s head precludes that possibility. Since he was entirely alone on the pier the obvious conclusion is that he shot himself. Not one person in Brenthithe believes that Stanlake killed himself. Inspector Arnold and Desmond Merrion do not believe it either. It was murder, but an impossible murder. Equally baffling is the fatal bullet. Scotland Yard’s ballistics expert has never seen such a bullet. It was clearly home-made, and fired from no known make of gun. Suspects there are in abundance. Hundreds of people had reason to want Stanlake dead. The trouble is, not one person in Brenthithe could have killed him. No-one could have killed him, but someone did. Street was always fairly sound when it came to plotting and this novel is no exception. The murder method is delightfully ingenious. The trick with impossible crime stories is to make said impossible crime suitably unusual and baffling whilst still making the solution plausible. The trick is pulled off here with considerable success. Street loved clever plots involving guns, perhaps not surprisingly in view of his service as an artillery officer in the First World War. Street had later transferred from the artillery to intelligence. It’s hard to think of a more perfect background for someone who would turn to the writing of detective fiction - an insider’s knowledge of both ballistics and the art of deception! In Dr Priestley Street had created a reasonably colourful fictional detective - opinionated, eccentric and cantankerous. Desmond Merrion by comparison seems a little on the bland side. Street was more interested in plotting than in characterisation in any case but in this novel he does create one memorable character - the town of Brenthithe itself. It is a town divided against itself. It is also a town caught between the past and the future. It’s rather like England, a country already in decline caught between an industrial past and an uncertain future that might bring prosperity to some but ruin to others. All very prescient for a novel written in 1938. Street shows sympathy for both sides in the divided town. Stanlake was a very abrasive man but in his own way he believed he had the best interests of the town at heart. Like most visionaries his vision had some huge blind spots in it. Whatever his faults he did not deserve to be murdered, but on the other hand it’s hardly surprising that those whose livelihoods were threatened by his plans should have considered him to be a deadly enemy. I can’t help thinking that this novel would have been even more fun as a Dr Priestley mystery. As it stands Death at Low Tide is still a fine example of the detective fiction of the 30s. Highly recommended.